The name of ‘Mysore Style’ refers to the city of Mysore, where Guruji Sri. K. Pattabhi Jois, taught for more than 70 years the practice of ashtanga yoga in its traditional method. In these classes, students will learn individually and gradually the sequence, appropriate to their level and rhythm. Although the student is in class with more people, the instruction is individualized, it is an assisted self-practice. The Ashtanga Yoga sees each student as unique, that is why the postures must be adapted to the individual and personalized teaching. Some students may learn faster or be fitter, while others are less fit or have health problems and will progress more slowly. The teacher will guide you posture, at a pace that is right for you. Each position is based on the previous position, so that when you arrive at a position that is challenging or difficult, we will work so that you can do it, and you will move on to the next one. 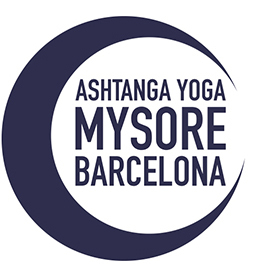 The goal of Mysore classes is to develop a personal practice. During the primary led classes, the students are guided in unison through the postures of the sequence of the Primary Series. The counting is in sanskrit following the traditional method. The guided classes are an opportunity to remember and master the vinyasas, the names of the postures, and they will help you to improve your resistance and concentration. If ou have never practiced ashtanga yoga or have tried only some guided class, we recommend you the beginner’s course or basics of ashtanga yoga. Mornings or afternoons in Mysore Style program: The beginner’s course consists of unlimited classes (Mysore-style classes) within 4 weeks of your first class, with a commitment to practice at least 2 days a week. You can start any day of the month and the duration of mysore classes are approximately 45min. Booking is required. Intensive Weekend. Check dates and prices. Individual attention that adjust to the level, flexibility and condition of each student, whether you want to start your yoga practice or want to deepen by addressing specific conditions. Flexible schedules and personalized sessions adapted to your needs.